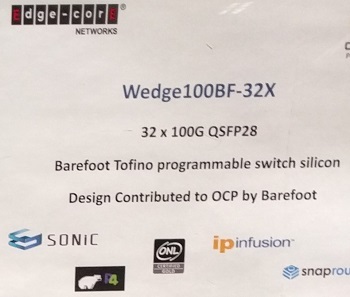 This switch is a me too implimentation of the Wedge100C changing out the Cavium ASIC for a Tofino. It is available as either 32 or 65 100G ports. It was introduced to the OpenCompute Project in a short slide show. A more formal presentation spec is in the OCP project files. Taking photos while crusing the OCP show floor is an imperfect process. If you don't know what you're looking for, you can easily miss something. This sign was within the camera view of a picture of a different switch. Presumably if I had looked, I would have seen it. Perhaps more valuable than yet another switch beauty shot is the indication of software that supports the Tofino. This picture was taking on March 21, 2018. While it would be most comforting if Edgecore had a data sheet for the switch, it is of some consolation that both the 32 and 65 port versions are listed as for sale on the KernelSoftware web site. But just because you can order it doesn't mean you can get it. The Wedge100BF-32X has a more traditional Edgecore P/N AS7616-32X. The Wedge100BF-65X has a more traditional Edgecore P/N AS7616-65X.